This is a digression. It won’t help you to fix anything….except maybe make a start on the World….but then, that is too far gone to warrant the effort of throwing a spanner in it. This little dissertation comes about from my various involvements with Carlsbro, both the real one of yesteryear and the imaginary one from China. Or wherever. The photo is of the TC60 (actually the one after it but it looks about the same). This was Stuart Mercer’s first production (not unlike the AC30 from a distance but utterly different from every other point of view). That gentleman started the business and designed the first amps. The school group (‘band’ as it would be called now, but they were ‘groups’ then) that I accidentally started in 1959 bought a complete set of this gear from a stable block in Jenford Street, Kirkby-in-Ashfield, where he made them, in 1963. That was a couple of guitar combos, a bass top and cabinet, and a 60 watt PA system with a pair of 2×12 speaker cabinets. A total of 240 watts rms of valve power, and it was bloody LOUD. The whole lot was also £600+ and in 1963, for a group of school kids, that was a lot of dough. On the never-never (hire purchase) of course. 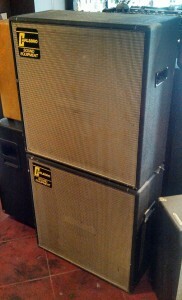 This was the Carlsbro bass stack. Amp missing but that looked a lot like all the others. As with most gear of the time, schematics were not considered a black art and were easily available. In fact they were often supplied in the bottom of the cabs. Or in the case of Leak, Wharfedale and the like, they were actually stuck into the bottom chassis plate. Very sensible. Why is that? Too complicated? Too clever? Too self-interested? Narrrr…..none of that. They just don’t have ‘CLASS’. You can’t buy it, you can’t put a price on it, but you know when it’s there. 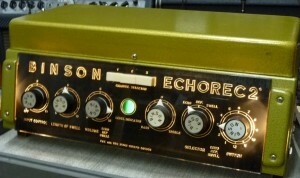 Don’t ask me why, but a falling-to-bits AC30 or a Binson Echorec absolutely reeks CLASS. Whereas your state-of-the-art Mackie desk, or Blackstar whatsit just doesn’t. I mean just look at this thing. TOOO COOOOL. And they sound….pheeewwww. Back to the ‘history lesson’. It must be pretty obvious that I am terminally biased (?) against modernity. The price of being an old git. But I don’t care. Anybody who hates touch screens and apps and phones that take photographs and double as life rafts and do everything, but badly, can’t be all bad. You can argue with that if you like, but as I don’t care what you think, you would need to find somebody else to argue with. Stuart Mercer started Carlsbro, as we said, in stables in Jenford Street. Presumably after the cows had been put out. He then did a lot of sweating, building prototypes. Much of this sort of grafting work is no longer done in modern design. In fact, a bloke with a degree in computer software would be better suited to designing a modern amp (even though he knew more about elephants than electronics) because this is where the ‘models’ come from. Software programs. But Mr. Mercer had a problem. He was a qualified TV engineer, and TV engineers know little about the design of big valve power amps, but plenty about valve preamps. 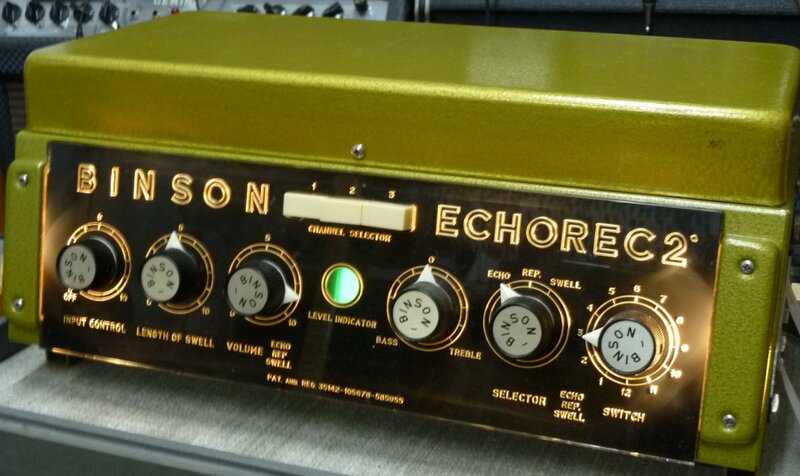 So he could design the tone circuits and such, but what to do about a power amp? This is where a stroke of brilliance, much representative of those days, struck him. 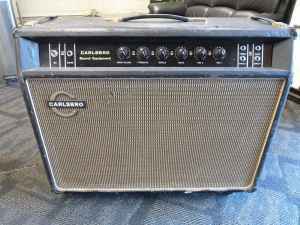 He bought in a Leak 50 watt rms power amp, and SCREWED IT IN THE BOTTOM OF THE CABINET!!!! From there he had to build a connecting lead from the preamp to the Leak amp and Walla !!!! A perfect solution. Doubly so, because keeping the power and preamp sections physically away from each other is a great piece of design strategy. There might be more of this dismal rubbish; I’ve really enjoyed this tirade of insults to current thinking. I don’t really deserve a cup of tea and a macaroon, though. But what the hell…. There is the possible beginnings of a story to this one. So, as we are all ‘friends’ (in wonderful internet-speak that is. And bearing in mind you don’t know me from Adam. Or Eve for that matter) I let you in on an interesting prospect. A gentleman I knew from a long way back called me out of the blue to ask if I would care to figure out why the amp project he had built does nothing but make nasty noises. This is regardless of what kind of nasty noises are being shoved into the front, you understand. The answer to that enquiry, although the problem I find very interesting, would usually be something like ‘GET THE HELL OUT OF HERE!!! !’ There are cans of worms and bucket loads of them, and sorting out somebody else’s design is definitely a bucket load. But Will is no idiot, a genuine bloke, and a good businessman. I don’t know about the first two but I definitely do not fall into the last category. The idea of somebody else doing business-thingies while leaving me to sort out technical issues might work out alright, thinks I. The problem he has is with parasitic oscillation. Basically the amp is unstable (and unusable.) Not to give away too much, part of his idea was involving a class A output stage. A push-pull (class AB of some description) output stage is a naturally stable design. The reason that power amps become unstable is often that the power rail (this is a valve amp) carries some of the signal of the output back to the preamp stages and produces a positive feedback loop, not unlike acoustic feedback, which is also a positive loop. In a push -pull stage, one valve conducts through the primary winding of the centre-tapped output transformer, and the opposite valve conducts through the other half of the winding. This means that the power rail that supplies the centre tap, has no signal content because the two halves of the transformer cancel each other out. It’s not quite like that, but close enough. Class A, for all that is trumpeted about its wonders has three serious failings. Firstly, It has to take a high dc current from the supply. It has to be biased so that the valve(s) will conduct the entire signal. Secondly, there is no cancelling effect from the dc supply rail. So the smoothing has to be very substantial, in order to kill off the inherent signal in the dc rail that is pulled by the output valves. Thirdly, the push-pull arrangement also cancels out smoothing ripple at high current drain. Again, class A relies entirely on major smoothing capacitors, iron-cored chokes etc to eliminate the 100hz ripple generated by high dc current drain. So, although I’ve not seen the amp design yet, these are the things I’ll be looking for. Class A amp building is not an easy assignment. I’ll keep you posted on the hair loss and macaroon situation.